Mexican food can be a spicy and delicious way to change things up at your wedding reception. Instead of having the traditional meat and vegetables served dinner, why not let your guests choose from their Mexican favorites by offer a taco and fajita bar. You can select starters and then the buffet style main dishes come with options included in the low and affordable prices. This menu is considered cheap for catering in Memphis, TN but that doesn’t mean any quality is sacrificed. Affordable Catering will not only help you stay on budget, but will blow your guests away. This top catering company can suit any taste and they also take special requests if you would like to customize your wedding menu. If you want a light lunch with simple sandwiches or a Southern style crawfish dinner, they make it happen. With an assortment of menus for each meal, holiday and event, you can use the menus of previous events or develop one of your own. Either way you will be eating something you love. 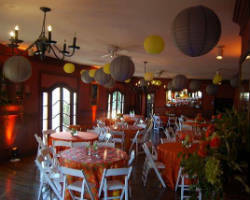 First and foremost The Magnolia Room is a breathtaking wedding reception venue. Secondly, they are a local catering service that has been working to provide couples and guests with some of the most delicious on-site meals. You can choose whether you want Southern or Italian catering as well as if you want a sit down meal or a buffet. 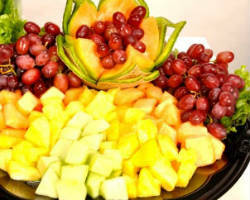 Choosing this venue and catering service means you will have hot fresh food as well as fewer vendors and less stress. 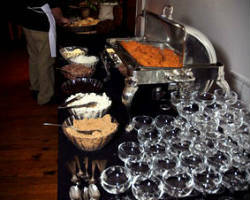 Maximillian’s Catering is for traditional or upscale events. They provide a menu much like what you would find in the nicest restaurants. In addition to their classic menu, they also offer to set up, clean up, deliver and staff your wedding. This is not simply a catering company but rather a trusted friend for your big day. They also can provide bartending to keep you and your guests well watered throughout the celebration. This caterer is the best in the business for posh weddings and corporate dinners. India Palace is the go-to place for Indian food in all of Tennessee that is why they have branched out to become one of the most popular wedding catering companies in Memphis. Their catering menu includes everything their restaurant menu has on it. 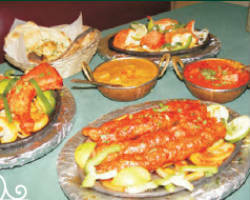 This means you can have your favorite starters, sides, curries, rice, and nan breads on the biggest day of your life. Not only do they have countless options but they also offer their catering at an affordable price for any special occasion. Catering isn’t just about the food and the service but it is about how it all comes together to provide everyone with an enjoyable and memorable celebration. 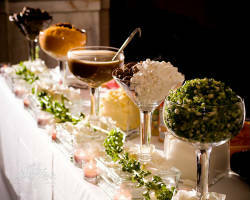 CFY Catering provides unique dishes and finger food for your wedding to whatever theme and style you choose. In addition to helping you design a custom menu, they also try to use the freshest local ingredients to ensure you and your wedding guests get the best dishes possible. This caterer is also unique in that they work to minimize their impact on the environment. Panini Catering with Java Coast is known for providing mouth-watering hors d’oeuvres and dishes but they also offer options that are unique to the entire catering industry. They have a variety of specialized drink and sweets buffets. They can set up a cappuccino bar, smoothie bar, milkshake and ice cream bar, and specialty drinks named after the happy couple. This local caterer is committed to not only bringing you unique dining options, but also providing hot and fresh meals that are restaurant quality. 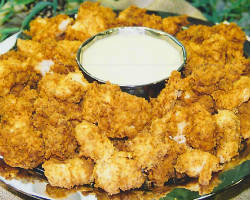 For 15 years Heart & Soul Catering has been serving unique and tasty menus at weddings all around Tennessee. 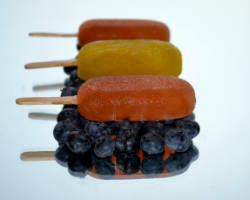 The gourmet choices they offer are a mixture of contemporary food art and authentic Southern cooking. In addition to their upscale take on local dishes, they also offer the option to have a Caribbean, Mexican or Mediterranean station. Having a wonderful meal shouldn’t be complicated on your wedding day, which is why this catering service works to not only provide great service but a stress-free meal. World famous Southern BBQ is exactly what you’ll get when you choose to have Corky’s Ribs and BBQ Memphis. 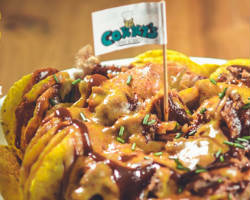 Traditional Sunday family BBQ’s can be a part of your wedding day when you choose Corky’s to cater and serve your event. Their full service menu includes a variety of succulent meats, sides, pies, drinks, and party trays. Their dinners begin at the fantastic price of just under $8 making this one of the most affordable yet high-quality caterers in the business.